Who doesn't know about Spice Girls! Popular British Girl Band which made a phenomenal success over 30 countries. Girls went crazy for their song "Wannabe", you could see every single girl humming dancing to it. Everyone loved Melanie Chisholm (Sporty Spice); Emma Bunton (Baby Spice); Melanie Brown (Scary Spice); Victoria Beckham (Posh Spice) and Geri Halliwell (Ginger Spice). We all have danced to their songs. Even the band parted ways but people still love Spice Girls and still recall the awesome music they made. 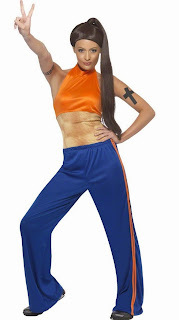 To surprise Spice Girls Fan, check our range of Spice Girls Costumes for Halloween. Emma Bunton was nicknamed "Baby Spice". Be the sweet pink Baby Spice this Halloween. Be adorable in this Pink knee length costume. This costume includes pink dress and pacifier necklace. Does not include wig or shoes. Victoria Beckham was nicknamed "Posh Spice". Posh Beckham-the DIVA of Spice Girl. Dress up as Posh Spice in this Black Jumpsuit costume to get that Diva look of Victoria Beckham. This costume includes jumpsuit and gloves. Does not include wig or shoes. Melanie Brown aka Mel.B was nickamed "Scary Spice". The loud Spice always had her madness on. 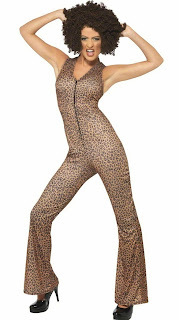 Dress up as Mel.B in this leopard print jumpsuit. Team it with black afro wig to get that look of "Scary Spice"
Geri Halliwell was nicknamed "Ginger Spice". This Union Jack Costume which Geri Halliwell is one of the popular costumes she wore in one of the Spice Girls Concert. This costume includes a Union Jack dress. Does not include wig or boots. Melanie Chisholm was nicknamed "Sporty Spice". She is tough, she is a tom boy of Spice Girls. This costume includes top with fake muscles and trousers. Does not include wig or shoes. If you are group of 5 girls planning to have theme costumes this Halloween, Spice Girl Costumes are a great idea. Each one of you can pick one Spice Girl Costume, dress up as one of the popular Band Girls and rock the party. Isn't it a great idea?